Hope everyone is well and enjoying the wonderful spring weather. Feel free to contact me with articles or news we can share with our membership. Thank you to all who submitted information included in this newsletter. Planning to add Marketing tips - let me know if you find these beneficial and I will continue each newsletter to add more idea. This April 20th we all enjoyed a wonderful presentation by Allison Bliss on Search Engine Optimization, Social Media and Marketing. 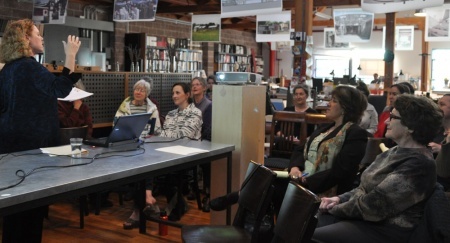 Thank you to Susie Coliver for hosting the April Meeting at her terrific studio in San Francisco. Bobby Sue has suggested that the hosting member give us a tour of the office – a great idea – I am sorry I didn’t think of it sooner. We will implement that from here on. We had over 20 people attending the presentation and two new members joined! have video instructions to teach you to use it. Analytics - see what your visitors are doing on your website. see the results of your efforts in your ranking. Many were so energized by the presentation we have decided to continue the discussion among ourselves on May 20th at Golden Associates, 4400 Market Street Oakland, CA. 510 465 4030. All are welcome to exchange marketing and social media ideas. Please RSVP to Leslie Golden – so I know how much food to get. While we know design is universal, the client wants to know that the individual they are hiring has the specialized knowledge to meet the project needs. Identify your strengths, unique benefits of your service and market to reinforce this message. Give lectures, blog or provide newsletter to provide information and establish your credibility. Repeat customers are easier to find than new ones. Can you provide useful information that will keep you on the top of their heads as the “go to” architect? Find a unique way to thank your costumers (avoid the traditional Holiday card as it gets lost among all the others). Pick a different day and a unique way to set your self apart from your competition. Consider your strengths and customize a thank you or marketing piece that is reflective of that quality. We all know that the economy is tough and the architectural and construction industry has been hit the hardest but no one should be unemployed – if you have been laid off from work consider yourself self employed - until that changes. Many larger firms (working in the public sector) need to partner with smaller, minority or women owned companies to meet goals set by public agencies. Get certified as a Women Business Enterprise (WBE), Small Local Emerging Business (SLBE), Disadvantaged Business Enterprise (DBE) or Underutilized Disadvantaged Business Enterprise (UDBE) with your local City or County Regulatory Agency. Get certified with as many agencies as possible, attend RFP’s and offer your services to larger firms. You may find a win-win situation. Put these certifications in your promotional material to distribute this information. Post your residential portfolio on www.houzz.com. It is a web site with over 30,000 pictures posted by Architects, Interior Designers and Landscape Architects. The more pictures you post the higher your ranking. You will have an opportunity to write a description of your firm, post photos, videos and more. Look through the web site to see ways to engage your potential clients in a dialog. You can create idea books and discuss design issues which you feel are important and will be of interest to others. While the economy is still slow, expand your accreditations to increase your market appeal. Individuals and public agencies are recognizing the need to develop in a sustainable manner. Expand your expertise through accreditation; USGBC LEED AP, Build it Green - Berkeley, California High Performance Schools – CHPS, Bay Friendly Landscape Guidelines from stopwaste.org and others. Any and all of these will help you position yourselves in the new economy. Third party raters are a growing industry and will be another source of income. Providing Pro Bono work will help the Community, get you working again and can be a valuable tool in increasing your professional exposure. Your local school, religious community or other non profit organization can use your skills and help promote your services. “The 1%” is a non profit organization created to connect non profit organizations with design professionals offering Pro Bono services. Their web site also has a place to publish your previous Pro Bono work. Get yourself out there! Refer to the “Third Annual Survey of Pro Bono Services” included on their webpage www.theonepercent.org. BAHA's annual spring house tour of houses by Julia Morgan will be held on May 2, 2010 from 1-5 p.m.
Betty Marvin will present "A Visit with Julia Morgan" at the Berkeley City Club on Thursday, April 22 at 7.30 p.m.
Inge Horton will present a talk on "Julia Morgan's Cohorts" on Thursday, April 29 at 7.30 p.m. at the Hillside Club. The Chicago Women in Architecture is hosting a presentation at: AJ Kane Gallery, 119 N. Peoria Street, Unit 2B. Free to CWA members and $10 for non-members. at Golden Associates at 4400 Market Street, Oakland on May 20th at 6pm – 8:30pm. Come and share your knowledge and learn something new. Our first San Francisco Supper Salon was held at Quan Bac, a French Vietnamese Restaurant. The food was delicious and the conversation stimulating. Along with the professional and personal sharing of info when OWA members gather, we chewed over the topic, “OWA: Who are we and why are we?” Everyone thought we should meet and dine again every other month. So, our next Supper Salon will be May 24, Monday at Quan Bac at 6:30/7:00 PM. A reminder with details will be sent out later in the month. Informal East Bay dinner the second Wednesday of the month at “Gather” on Oxford Street in Berkeley. All are welcome to join us between 7pm and 8:30pm. Register for the Hillsborough Historic Homes Tour featuring design by OWA member Topher Delaney! Congrats to OWA member Cary Bernstein Architect for receiving a 2010 IIDA-NC Honor Award for One & Co in the category of Work: Small (under 20,000sf). Alice Prussin was the lighting designer! The Steering committee has meet three times and has some exciting new projects and would like to invite three additional members to join the steering committee. We welcome members to nominate others or self nominate yourselves to join our active and fun steering committee. If you are interested please submit at least one paragraph about yourself and why you would like to be on the steering committee. This will be due late summer to be included in the newsletter to allow the membership time to review the candidates and vote during the General Meeting. Have you ever entertained the thought of becoming more involved with OWA? Or wondered how it operates? Well, here’s your opportunity to go backstage and see how it works. Maybe even become part of the cast. This is the year of “The OWA Policies and Procedures Manual”. A draft has been posted here (for member viewing only) by Leslie Golden with comments from Leslie Allen and Wendy Bertrand. Joanne Chow Winship will be coordinating the review and revisions with hopefully, lots of comments and suggestions from the membership. 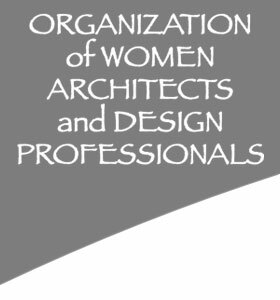 It would be great if members came forth and a working group was formed to meet and discuss the outline and operational details for a participatory OWA organization dedicated to initiating and carrying out “activities to improve the professional standing of women in architecture and related fields”. It is anticipated that two meetings would be able to get a majority of the work done. Karlene Gullone is leading the Mentorship Program. It is designed to help members take advantage of the diversity of seasoned professionals within our organization. Karlene can be contacted to matched up mentors and those in need of assistance. Alternatively, she maybe able to use our web site ask mentors to post their bio on our web site have the people who want to be mentored call the individual offering the mentorship. Contact her to discuss your needs. The OWA has offered Health Insurance Plans to its members, both women and men, for over 25 years. Our Health Plan is available to individuals and firms to members in good standing. Please pay your annual dues to participate in the Health Plan. Contact John & Ann Jakiemiec for details. Please note it does not include a Dental plan. Thank you for renewing your membership! All membership renewals were due February 1, 2010 and are valid through January 31, 2011. If you have not renewed your membership yet, please log on to your profile page, review your contact information and send us your payment. If you are not an OWA member we encourage you to Join Us! Leslie Golden, ASLA, LEED AP and Rainwater Catchment Accredited Professional, will provide an overview of Rainwater Catchment Systems and a case study of their current project for the Claremont Middle School, Oakland Unified School District. Issues and lessons learned will be discussed. Come and learn how to incorporate rainwater water into your next project. Refer to the calendar for details. My husband and I spent Saturday on a Habitat for Humanity type project....it was a bit different in that it was his church rather than the official organization, which we've also done for many years. This church, Menlo Park Presbyterian Church (or MPPC) takes on a dozen school/classroom remodels every year. Remarkable remodels happen in a weekend, and probably have for nearly 30 years. MPPC has a long-term commitment to the East Palo Alto schools for teacher-support, educational materials support, etc. I like that they walk-the-talk. Our project was to change a former shower room into a small sports center. I had a discussion with one of the middle-school youngsters who would be using the revamped sports center. I didn't think much about it at the time, but upon relating the story to my husband at the end of the day I realized that I need to walk-the-talk. East Palo Alto. The name conjures up images of peeling paint, unrepaired homes, and car-studded streets. East Palo Alto lies between Highway 101 and the lower end of the San Francisco Bay. Comprised mostly of long-time African-Americans and newcomer Hispanics, the area is known for its car-covered lawns and its gangs, not necessarily in that order. Very few people know that East Palo Alto crosses Highway 101 and butts up to the lush well-manicured lawns of Palo Alto, but it does. A worn-down middle school sits on a huge property just blocks down the street from the Home Deport/Highway 101 corner. Cesar Chavez Academy houses Grades 6, 7 and 8. Courtesy of caring teachers, classrooms open well before school starts, during lunch, and after school. There are many reasons why this is valuable. For example: there are a number of Pacific Islander families, living 15 - 20 in a standard home. No closets exist in these homes, clothes are simply dumped in the middle of a space. If it fits, you wear it. Privacy, study desk spaces, and quiet are nonexistent. Consequently, a number of these students want to "hang out" at school as long as they can. An open school means a place to study, a quieter environment, and maybe a chance to "be yourself". Many students excel at sports, and the school encourages them. These students must have a 2.0 or better gradepoint to play a sport. Miraculously, during their sports season the students work hard to keep and maintain a 2.0. During the off-season, however, many give up. The local P.E. teacher and the school staff have decided to create an after-school Sports Center. Hoping to make it "rad" and "cool", a student cannot be a part of the Sports Center unless they maintain a 2.0 or better GPA. That's where the renovation comes in. On a warm Saturday and Sunday in April a group of 10 - 20 folks convened to transform a former locker room, Our project included demolition, carpentry, and paint. It did not include a water line rupture, removal or small I-beams, chipping out concrete, nor refilling chipped concrete floors with Ardex (gypcrete). As anyone who's worked on a building project knows, this is not unusual. Pain in the rear and it delays the proposed schedule, but still common. Part of the assembled team included a well-known structural engineer (he held the copper water line together as best he could, for nearly an hour while everyone scrambled to see where the water shutoff was located), electricians, and several former carpenters who were knocking together lockers, benches, and nailing up replacement gypboard walls. Others put together shadowboxes promoting varsity sportshirts and team photos. To clean up the beater used to mix the Ardex, I stepped outside. There I discovered an 8-grader munching happily on a sandwich. I was surprised to learn that the students from this middle school transfer across the highway into one of the most competitive high schools on the Peninsula. I asked this young lady, I'll call her Flavia, how she felt about the competition at this high school. "Well," said she matter-of-factly, "My mother and my older brothers all went to the high school. They all dropped out, though. None of them finished high school." "They didn't like high school?" I asked. "They didn't do well?" "Oh, they couldn't avoid the gangs that are there," Flavia replied. "My third brother, H, really liked school. He wanted to go on to college. But both gangs kept pressuring him to join one. He told them he didn't want to be a member of either gang. He couldn't stand it. He couldn't get them to leave him alone, so he dropped out." Flavia stopped and ate another bite of sandwich. "Then he saved his money and bought a car, but one gang decided to get even and they torched the car. H. hadn't paid off the car, so the gang said it was stolen. He's in jail now. He shouldn't be there. He's coming out at the end of April." "How about you, how are you feeling about high school? Do you like school?" Another bite of sandwich and a thoughtful nod to herself. "I'm nervous. Sometimes I don't understand and I don't want to get behind." While we designers are concerned with the built environment, there's an intersection between the lives of people using the buildings, and our community. Anyone of us has enough education that we can help with tutoring. It takes a village, as the saying goes. Hopefully you'll give some consideration to tutoring on a regular basis today.